Situated by the ocean, this hotel is within 1 mi (2 km) of Progreso Lighthouse and Progreso Beach. Playa Uaymitun is 8.9 mi (14.3 km) away. Situated by the sea, this aparthotel is within 1 mi (2 km) of Progreso Lighthouse and Progreso Beach. Playa Uaymitun is 8.1 mi (13.1 km) away. 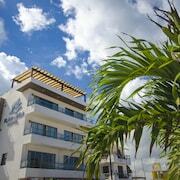 Situated in Progreso, this hotel is within 1 mi (2 km) of Progreso Lighthouse and Progreso Beach. Playa Uaymitun is 7.2 mi (11.5 km) away. Nestled on the beach, this Progreso hotel is within 1 mi (2 km) of Progreso Lighthouse and Progreso Beach. Playa Uaymitun is 7.7 mi (12.3 km) away. Situated by the sea, this hotel is within 1 mi (2 km) of Progreso Lighthouse and Progreso Beach. Playa Uaymitun is 8 mi (12.9 km) away. Fantastic location right across the road from the beach. A foot shower in the hotel lobby for when you return from the beach. Didn't use the pool but it looks clean. Fan & aircon worked well. Could open the many windows to freshen air with a nice seabreeze. Stayed in a 2 bed room with a kitchenette. Very spacious. Peculiar arrangement of doors in the bedroom/bathroom...I had a bit of a scare when I first entered and couldn't find the bathroom b/c if the bedroom door is open, you can't enter/see the bathroom. Shower has 2 dials: cold and less cold. Sheets and pillowcases had a few marks/stains on them but I wouldn't say it was bad. No in room safe. Pleasant staff. I would return. Where to find Progreso hotels near an airport? How can I find hotels in different Progreso neighborhoods? Where can I find hotels in Progreso that are near tourist attractions? For those looking for a hotel or apartment close to Progreso, there are a few options. You'll find 4 Expedia-listed hotels within a 0.1-kilometre (0.06-mile) distance of the heart of town. 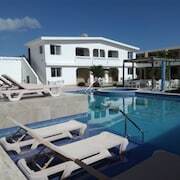 You will find Hotel & Suites Domani and Condominios Orca C3 within 3 kilometres (2 miles) of central Progreso. 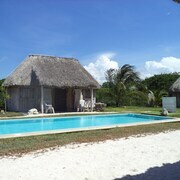 The The Hacienda Xcanatun is situated 18 kilometres (11 miles) away from the center of Progreso. Another hotel is the Holiday Inn Express Mérida, which is positioned 25 kilometres (17 miles) away. The City Express Merida and also the Hotel Dubrovnik are some other options in Progreso. 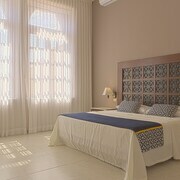 The nearest accommodation options in Merida are Uxmal and Izamal. Uxmal is 100 kilometres (61 miles) to the south of Progreso, while Izamal is 75 kilometres (47 miles) to the southeast. 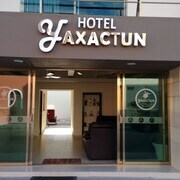 Uxmal hotels and apartments include the The Lodge At Uxmal and Hacienda Uxmal Plantation & Museum. 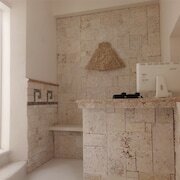 While Izamal apartments include the Hotel Hacienda Izamal and Hacienda Sacnicte. Before you head home from Merida, ensure you experience some local sport. Visit Estadio de Beisbol Kukulkan to the south of Progreso. For tourists who are keen on booking accommodation nearby, make a reservation in the Hotel Casa Azul or Rosas & Xocolate Boutique Hotel. Manuel Crescencio Rejon International Airport is a logical airport for flying into Progreso. It is 40 kilometres (23 miles) away. If you would like to stay nearby, try the Hotel Hacienda VIP or The Villa Merida Hotel. What are the most popular Progreso hotels? Gorgeous Ocean View With Pool & Rooftop Terrace! Just Steps to Beach! Gorgeous Ocean View With Pool and Rooftop Terrace! 30 Steps to the Beach! Are there hotels in other cities near Progreso? 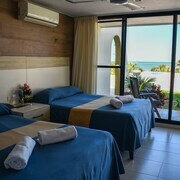 What other types of accommodations are available in Progreso? Explore Progreso with Expedia.ca’s Travel Guides to find the best flights, cars, holiday packages and more!